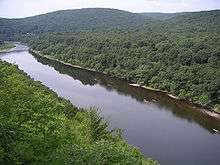 The Delaware River is a major river on the Atlantic coast of the United States. Its watershed drains an area of 14,119 square miles (36,570 km2) in five U.S. states—New York, New Jersey, Pennsylvania, Maryland and Delaware. Rising in two branches in New York state's Catskill Mountains, the river flows 419 miles (674 km) into Delaware Bay where its waters enter the Atlantic Ocean near Cape May in New Jersey and Cape Henlopen in Delaware. Not including Delaware Bay, the river's length including its two branches is 388 miles (624 km). The Delaware River is one of nineteen "Great Waters" recognized by the America's Great Waters Coalition. 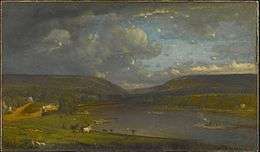 The Delaware River rises in two main branches that descend from the western flank of the Catskill Mountains in New York. The West Branch begins near Mount Jefferson in the Town of Jefferson in Schoharie County. The river's East Branch begins at Grand Gorge near Roxbury Delaware County. These two branches flow west and merge near Hancock in Delaware County and the combined waters flow as the Delaware River south. 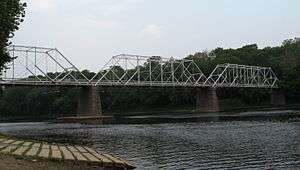 Through its course, the Delaware River forms the boundaries between Pennsylvania and New York, the entire boundary between New Jersey and Pennsylvania, and most of the boundary between Delaware and New Jersey. The river meets tide-water at the junction of Morrisville, Pennsylvania and Trenton, New Jersey at the Falls of the Delaware. The river's navigable, tidal section served as a conduit for shipping and transportation that aided the development of the industrial cities of Trenton, Camden, and Philadelphia. 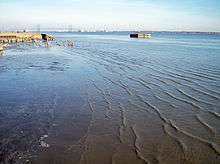 The mean freshwater discharge of the Delaware River into the estuary of Delaware Bay is 11,550 cubic feet (330 m³) per second. In 1609, the river was first visited by a Dutch East India Company expedition led by Henry Hudson. Hudson, an English navigator, was hired to find a western route to Cathay (present-day China), but his discoveries set the stage for Dutch colonization of North America in the seventeenth-century. Early Dutch and Swedish settlements were established along the lower section of river and Delaware Bay. 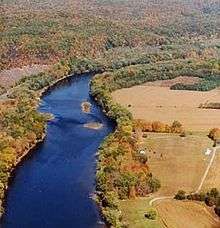 Both colonial powers called the river the South River, compared to the Hudson River, which was known as the North River. After the English expelled the Dutch and took control of the New Netherland colony in 1664, the river was renamed Delaware after Sir Thomas West 3rd Baron De La Warr, an English nobleman and the Virginia colony's first royal governor who defended the colony during the First Anglo-Powhatan War. The Delaware River is named in honor of Thomas West, 3rd Baron De La Warr (1577–1618), an English nobleman and the Virginia colony's first royal governor who defended the colony during the First Anglo-Powhatan War. Lord de la Warr waged a punitive campaign to subdue the Powhatan after they had killed the colony's council president, John Ratcliffe, and attacked the colony's fledgling settlements. Lord de la Warr arrived with 150 soldiers in time to prevent colony's original settlers at Jamestown from giving up and returning to England and is credited with saving the Virginia colony. The name of barony (later an earldom) is pronounced as in the current spelling form "Delaware" ( i/ˈdɛləwɛər/ DEL-ə-wair) and is thought to derive from French de la Guerre. 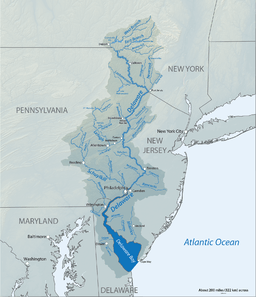 The Delaware River played a key factor in the economic and social development of the Mid-Atlantic region. In the seventeenth century it provided the conduit for colonial settlement by the Dutch (New Netherland), the Swedish (New Sweden). Beginning in 1664, the region became an English possession as settlement by Quakers established the colonies of Pennsylvania (including present-day Delaware) and West Jersey. In the eighteenth century, cities like Philadelphia, Camden (then Cooper's Ferry), Trenton, and Wilmington, and New Castle were established upon the Delaware and their continued commercial success into the present day has been dependent on access to the river for trade and power. 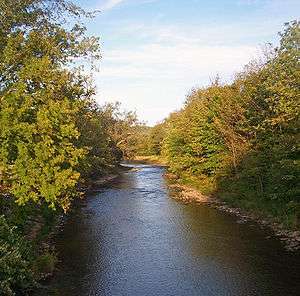 The river provided the path for the settlement of northeastern Pennsylvania's Lehigh Valley, and northwestern New Jersey by German Palatine immigrants—a population that became key in the agricultural development of the region. 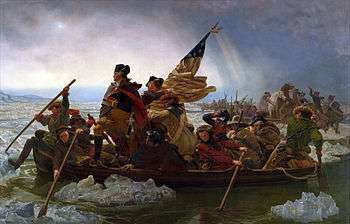 Perhaps the most famous "Delaware Crossing" involved the improvised boat crossing undertaken by George Washington's army during the American Revolution on the night of December 25–26, 1776. This led to a successful surprise attack on the Hessian troops occupying Trenton, New Jersey. Since 1941, the Delaware River Main Channel has been maintained at a depth of 40 ft (12 m). A 102.5-mile stretch of this federal navigation channel, from Philadelphia and Camden to the mouth of the Delaware Bay, is being deepened to 45 ft (14 m)., with a 2017 projected completion date. As of 2011, crude oil was the largest single commodity transported on the Delaware River, accounting for half of all annual cargo tonnage. Major ports and facilities along the river are the Port of Philadelphia, the Port of Camden-Gloucester, the Port of Paulsboro, the Port of Wilmington, and Delaware City Refinery. In 2015, the ports of Philadelphia, Camden, and Wilmington handled 100 million tons of cargo from 2,243 ship arrivals, and supported 135,000 direct or indirect jobs. The biggest category of imports was fruit, carried by 490 ships, followed by petroleum, and containers, with 410 and 381 ships, respectively. The biggest category of exports was of shipping was containers, with 470 ships. Projects to dredge shipping channels to a depth of 45 feet were completed in 2016. For more details on this topic, see New York City water supply system. The National Marine Fisheries Service is considering designating sixteen rivers as endangered habitat for the Atlantic Sturgeon which would require more attention to be given to uses of the rivers that effect the fish. ↑ The main stem from Hancock, New York to the head of Delaware Bay is 301 miles (484 km). ↑ National Wildlife Federation (August 18, 2010). "America's Great Waters Coalition". Retrieved August 18, 2011. 1 2 Pollard, Albert Frederick (1899). "West, Thomas (1577-1618)". In Lee, Sidney. Dictionary of National Biography. 60. London: Smith, Elder & Co. pp. 344–345. ↑ Tyler, Lyon Gardiner (editor). Encyclopedia of Virginia Biography. (New York: Lewis Historical Publishing Company, 1915), I:33-34. ↑ Grenier, John. The First Way of War: The American War-Making of the Frontier, 1607-1814. (New York: Cambridge University Press, 2005), 24–25. ↑ Versteer, Dingman (editor). "New Amsterdam Becomes New York" in The New Netherland Register. Volume 1 No. 4 and 5 (April/May 1911): 49-64. ↑ Schutt, Amy C. Peoples of the River Valleys: The Odyssey of the Delaware Indians. (Philadelphia: University of Pennsylvania Press, 2007). ↑ Weslager, Charles A. The Delaware Indians: A History (New Brunswick, New Jersey: Rutgers University Press, 1990). 1 2 3 4 5 6 7 8 9 Philadelphia Water Department. "Moving from Assessment to Protection…The Delaware River Watershed Source Water Protection Plan" (PWSID #1510001) (June 2007). Retrieved July 17, 2013. ↑ White, Ron W.; Monteverde, Donald H. (Feb 2006). "Karst in the Delaware Water Gap National Recreation Area" (pdf). Unearthing New Jersey Vol. 2, No. 1. New Jersey Geological Survey. Retrieved June 7, 2008. ↑ White, I.C. ; Chance, H.M. (1882). The geology of Pike and Monroe counties. Second Geol. Surv. of Penna. Rept. of Progress, G6. Harrisburg. pp. 17, 73–80, 114–115. ↑ One or more of the preceding sentences incorporates text from a publication now in the public domain: Chisholm, Hugh, ed. (1911). "Delaware River". Encyclopædia Britannica. 7 (11th ed.). Cambridge University Press. p. 951. ↑ Delaware Water Gap National Recreation Area (p. 7-8), Obiso, Laura, 2008. ↑ Delaware Water Gap National Recreation Area, njskylands.com. ↑ The Wine Institute. "American Viticultural Areas by State" (2008). Retrieved February 5, 2008. 1 2 Code of Federal Regulations. Section 9.49 Central Delaware Valley. (27 CFR 9.49) from Title 27 - Alcohol, Tobacco Products and Firearms. CHAPTER I - ALCOHOL AND TOBACCO TAX AND TRADE BUREAU, DEPARTMENT OF THE TREASURY. SUBCHAPTER A - LIQUORS. PART 9 - AMERICAN VITICULTURAL AREAS. Subpart C - Approved American Viticultural Areas. Retrieved June 30, 2013. ↑ New Jersey Division of Alcoholic Beverage Control. "New Jersey ABC list of wineries, breweries, and distilleries" (February 5, 2013). Retrieved May 2, 2013. An analysis was done comparing a list of wineries provided by the New Jersey Division of Alcoholic Beverage Control with the AVA's description in the Code of Federal Regulations. ↑ United States Army Corps of Engineers. Delaware River Main Channel Deepening. Retrieved July 25, 2013. ↑ Ruch, Robert J. Ruch (Lt. Col.), District Engineer, Philadelphia District. Delaware River Main Channel Deepening Project Delaware Valley Regional Planning Commission (January 20, 2005). Retrieved July 14, 2013. 1 2 U.S. Army Corps of Engineers. Delaware River Main Channel Deepening Project. (May 2012). Retrieved July 14, 2013. ↑ Delaware Riverkeeper. The Delaware River Main Channel Deepening Project: Background. Retrieved July 14, 2013. ↑ American Waterways. New Jersey A key link in the nation's import/export economy. Retrieve July 26, 2013. 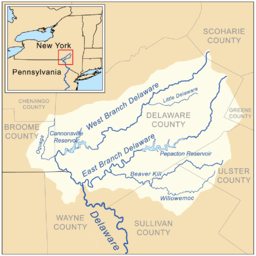 ↑ Delaware River Basin Commission (July 20, 2005). 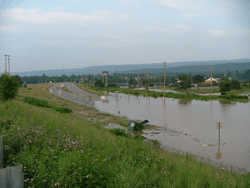 "Delaware River Basin Commission's Role in Flood Loss Reduction Efforts." West Trenton, NJ. ↑ "Athos 1 Oil Spill". University of Delaware Sea Grant Program. November 3, 2005. Retrieved April 29, 2006. ↑ "1985 Grand Eagle Oil Spill". University of Delaware Sea Grant Program. December 16, 2004. Retrieved April 29, 2006. ↑ "Presidente Rivera Spill – June 24, 1989". University of Delaware Sea Grant Program. December 8, 2004. Retrieved April 29, 2006. Wikimedia Commons has media related to Delaware River. 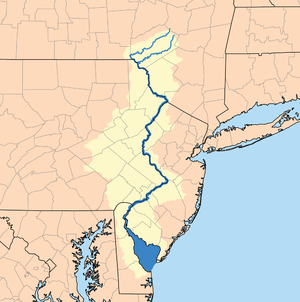 "Delaware, a river of the United States". Collier's New Encyclopedia. 1921. "Delaware River". The New Student's Reference Work. 1914. "Delaware. A river of the Eastern United States". New International Encyclopedia. 1905.